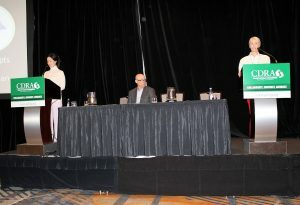 The Sheehan Group presented to American leaders of the C&D industry at a conference in Brooklyn, New York this month. Tara and Katie Sheehan presented to C&D industry delegates how the Sheehan Group has diversified the family-run recycling business through the years. Speaking at the Construction and Demolition Recycling Association Annual Conference they outlined the journey the business has taken since it was formed in 1974 by John Sheehan, with one vehicle. Today we collect and process construction waste to produce recycled products, including concrete blocks which we use in our own construction projects as well as sell. 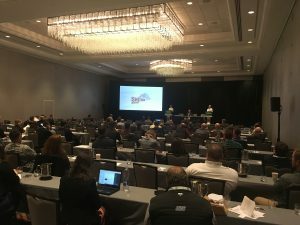 The conference also featured presentations on the market status of several materials, including asphalt shingles, recycled concrete, biochar, gypsum, and urban glass. There was also a sold-out exhibit hall showcasing the latest offerings for the C&D industry. The Sheehan business started as a haulage company transporting waste to landfill, but quickly began its diversification and recycling journey by moving into crushing and dry screening. It then gradually developed its services over time. In the past ten years the Sheehan Group has diversified to regenerative concerns – recognising we have a responsibility to leave the living world in a better state than we found it in. The strategy of renewing and reusing materials has established longevity and sustainable profits for future generations. The process started with an investment in a CDE Global construction and demolition waste washing plant. It uses the latest wet processing methods to recycle waste to create a range of certified sand and aggregates which are used in concrete products. You can read more about our sustainability values here. In the first six years of operation our CDE waste treatment facility has saved 600,000 tonnes of construction materials from landfill and put it safely back into use, as recycled aggregate. Via our groundworks and civil engineering company John Sheehan (Oxford) Ltd our recycled aggregates have been used in some of the UK’s finest modern architectural projects. In 2014 a granulated activated carbon water treatment system was installed to enable the processing of materials that may be contaminated with Volatile Organic Compounds. This enabled us to source contaminated soils, such as material from petrol station forecourts and highway sidings. It is then washed via a recycled water system. This process reduces the environmental impact of recovering contaminated soils. You can read more about our contaminated soil treatment service here. In 2015 the Sheehan Group acquired a 50% share of H Tuckwell and Sons. We provide washed recycled aggregate for the business to use in its products to broaden the sustainability model. As part of our next phase of diversification we are currently installing a 3.5MW WID compliant biomass boiler to enable us to become carbon neutral, the boiler will be used to produce electricity using a renewable fuel – biomass in the form of waste wood that would otherwise be destined for landfill. Diversification will always evolve as new technology is created and planning regulation changes. As a company we will continue to strive to remain at the forefront of change in sustainable construction.